Save and quickly load named combinations of settings that work well in achieving certain results. User defaults (created by using Preset dropdown "Save As User Default Preset") are shared between Revoice Pro Sessions and running instances of Revoice Pro. In the New Process window you can choose an existing Preset from Factory Presets, User Presets and Shared Presets (if they have been created). However, you cannot create or modify Presets within this menu. You can only create or modify Presets from the individual Process Control Panels. When you first create a Process, if you do not change the Preset selection when you run the process, Revoice Pro will use the Factory "Default" Preset. This may or may not give the results you want. There are some existing Factory Presets that you can use as a starting point, which have self-explanatory names. As you use Presets, they will show up in "Recent Presets". You can also choose Presets in the Process Control Panel (next section). Open the Process Control Panel. Factory Presets can't be modified, but you can load one, and either save it as the User Default Preset, or modify it and save as a new Preset that you can name. For efficient working, Recent Presets will show the last five selected presets, with the oldest selection at the bottom of the list. Save As User Default Preset saves the current settings instantly as the User's Default Preset without opening any other window. That setting will be used in all further processing until a different Preset or setting is selected. You can experiment and create your own settings by changing the sliders in the Process Control Panel for that process. These settings will remain active and be saved for that process only. To save one of your own settings as a Preset, select Save as User Default Preset and/or Save As Preset in order to reuse it. 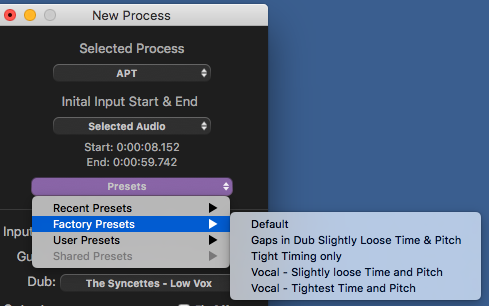 Give each setting you create and save as a preset a distinctive and helpful name, for example, as shown below "Closer Time and Pitch" and that name will appear next time you open the User Preset menu list.